Pin programs, files and websites to the Windows Taskbar. You can easily pin programs and websites to the Windows Taskbar. It's even possible to pin files, although this can take a little more effort. You can even pin Windows settings to the taskbar. 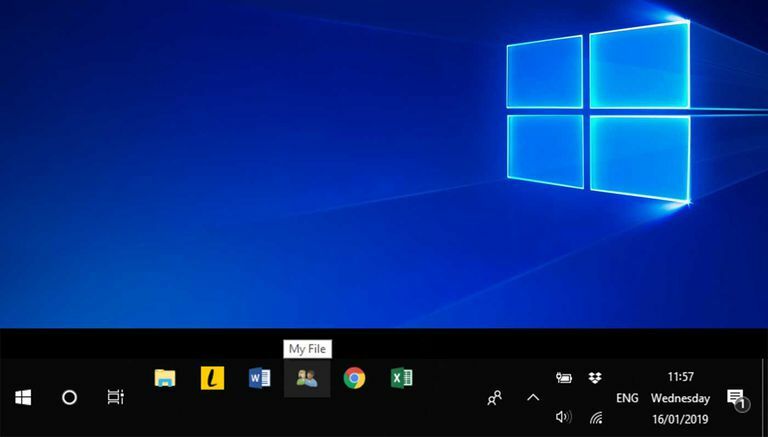 Pin Programs from Desktop Shortcuts: If you already have a shortcut to a program on your desktop, you can simply drag the shortcut to the Taskbar. The program will be pinned automatically. Pin Programs that are Running: You can also pin a program to the taskbar by first running it. Launch the program. You can do this from the start menu, by either typing the name of the program into the Search bar, or by finding it in the list of programs. Once the program is running, it appears on the Taskbar. Right-click the program in the taskbar to bring up the options menu, or swipe up from it if you're using a touch screen. Select Pin to taskbar and the program will be pinned. Change the file’s extension to .exe, noting its original value. Drag the file to the taskbar. It'll be pinned since it now appears to Windows as a program. Change the file's extension back to its original value/extension. Right-click the icon in the taskbar, right-click again on the file name, then select Properties. Identify the file name and also change the file’s extension back to the original value here. You should now have the file pinned to the taskbar, but it will have a generic app icon rather than a file icon. Going into the file's properties again gives the option to change the icon but it might not update until after you restart Windows. The jump list for a program is a great way to quickly access files you use a lot in that program. It contains files the program has recently opened, and you can also pin files you use a lot, so they always appear at the top of this list. To access this menu, either right-click a pinned program, or swipe up from it on a touch screen. The easiest way to pin a file to the jump list is to right-click it in the recent list, then select Pin to this list. If you drag a file directly to the taskbar, the program that opens the file is pinned, not the file itself. However, the file is also added to the program's jump list. To access this list, right-click the taskbar item, the file can then be opened from this list. To pin a website to your browser's jump list, simply pin it from the list of recent sites, just as you would for a file. Load the website in Chrome. Select the three vertical dots in the top right of the browser. Select More tools > Create Shortcut. A dialogue box will open. Name the shortcut whatever you like, then select Create. A desktop shortcut to the website will then be created. Drag the shortcut to the taskbar to pin it for later access. Pinning a website in Microsoft Edge is even easier. You simply select the three horizontal dots in the top right, then select Pin the page to the taskbar.